Successful Re-certification at AKW Equipment + Process Design : Our customers and business partners can trust in our service quality! 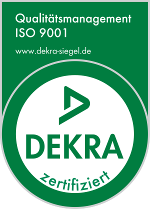 The team is proud to announce that we received our new QM-Certification, confirming that we have established and maintain a quality management system according to the standard ISO 9001:2015. The scope of certification includes the development and design, distribution, supply, installation, commissioning and after sales service of process equipment and plants. “Employees as well as business partners can profit from a solid and continuously improved quality management system. We are convinced at AKW Equipment + Process Design that a team working in a structured way, with systematic approach and methodology, is key to success. It also ensures that all our projects are handled with the same approach and attention to quality, cost and timeline. We will continue to work in this direction, and are already planning to implement new systems in the years to come that will further enhance our quality-driven project execution”, stated Mr. Thibaut Richard (General Manager at AKW Equipment + Process Design).